Approximate weight per package: 1.25 Lb. 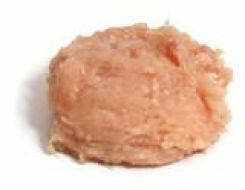 Make chicken burgers, chicken meatballs, or add a less fatty meat to your meatloaf mix with kosher ground white meat chicken. Just combine with your favorite seasonings and grill, broil or bake, however you like it.